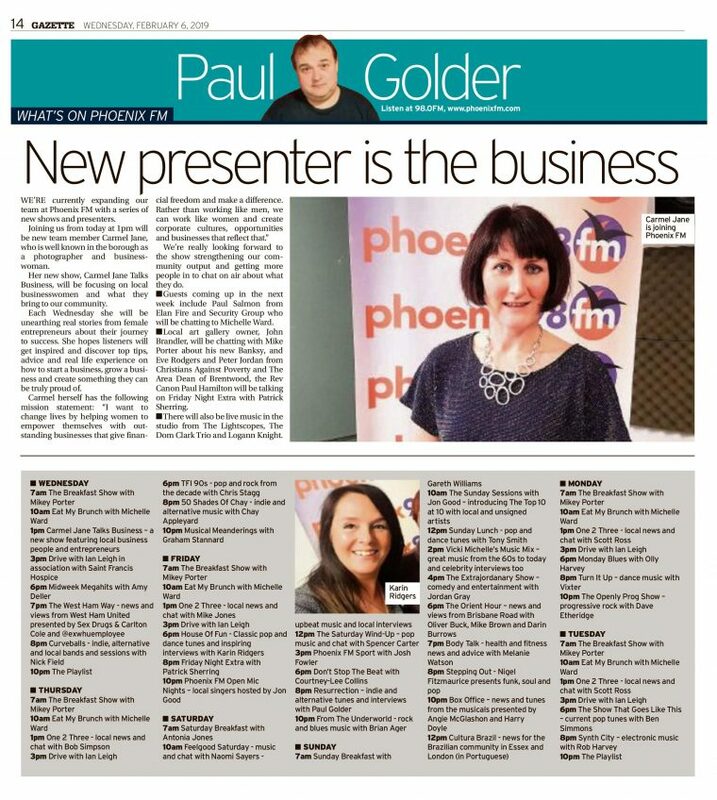 We’re currently expanding our team at Phoenix FM with a series of new shows and presenters. Joining us from today at 1pm will be new team member Carmel Jane, who is well known in the borough as a photographer and businesswoman. And her new show, Carmel Jane Talks Business, will be focusing on local businesswomen and what they bring to our community. Each Wednesday she will be unearthing real stories from female entrepreneurs about their journey to success. She hopes listeners will get inspired and discover top tips, advice and real life experience on how to start a business, grow a business and create something they can be truly proud of. We’re really looking forward to the show strenghtening our community output and getting more people in to chat on air about what they do. * Guests coming up in the next week include Paul Salmon from Elan Fire and Security Group who will be chatting to Michelle Ward. * Local art gallery owner John Brandler will be chatting with Mike Porter about his new Banksy, and Eve Rodgers and Peter Jordan from Christians Against Poverty and The Area Dean of Brentwood, Revd Canon Paul Hamilton will be talking on Friday Night Extra with Patrick Sherring. * There will also be live music in the studio from The Lightscopes, The Dom Clark Trio and Logann Knight.